Carillion, the UK's second-biggest construction firm, is being examined by the financial watchdog. It said the Financial Conduct Authority (FCA) is investigating the "timeliness and content" of its announcements from 7 December 2016 to 10 July 2017. During that period the HS2 contractor's share price plunged and its chief executive departed following a series of profit warnings. Carillion said it is co-operating fully with the FCA. In July 2017 Carillion said it was writing off £845m in revenue it had expected from several large contracts, and it admitted that its already big borrowings were becoming bigger. The profit warning, which resulted in the departure of chief executive Richard Howson, sent the company's shares down by about 40%. In November, Carillion issued another profit warning and warned it would breach its debt covenants, sending shares plunging again. However, it reached an agreement with its lenders last month to defer a test of its financial health, giving the company more breathing space. Carillion is a major supplier to the government and helps to maintain schools and hospitals. It is also part of a consortium building the £56bn HS2 high-speed rail link. 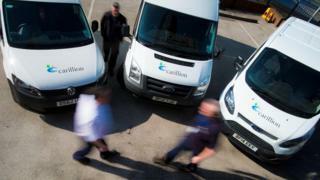 Shares in Carillion fell by about 4% in morning trading in London to 17.3p, valuing the company at about £73m. The stock had been trading at 238p a year ago.